This course provides guidance for the design of bulk fuel storage facilities, including bulk storage tanks and those components normally located within a typical bulk storage compound. These components include pipeline receiving facilities, tank truck and tank car receiving facilities, pipeline dispensing (pumping) facilities, tank truck and tank car loading facilities, and all related piping and equipment. Learn where isolation valves are required. This course is intended for mechanical and petroleum engineers, and other design and construction professionals wanting an introduction to bulk fuel storage facilities. This course will give engineers and others an introduction to delivery, storage and dispensing facilities for petroleum fuel products. 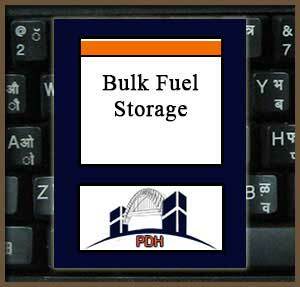 This is an introduction to equipment and facilities for bulk storage of petroleum fuels. After completion of this course you will have an understanding of equipment and methods employed in petroleum storage facilities, including equipment for delivering, receiving and dispensing fuel.